A woman in England says she captured an image of the Virgin Mary while photographing a cliff on Newquay's Western Beach in Cornwall. "There was nothing on the screen when I took the original photograph," Caroline Gray told The Sun. "Then when we got home the image of the Virgin Mary had appeared." Gray, a 38-year-old mother of three who works as a receptionist, snapped the photograph on Valentine's Day while walking with her husband -- and she insists she was merely trying to take a picture of an interesting landscape. Only after getting home and looking at the photo did she see a brightened section of rock that she says resembles iconic images of the mother of Jesus Christ. all i did was lower the brightness and raise the contrast to bring out the figure in the sun. this was done real quick for the people having trouble viewing it. The Apparition at Knock Ireland, 1879. The intention of this post was to shift gears from the run of UFO-related anomalies that have preceded it. As you will read, I have only partly succeeded in that. To set the stage, I should state for those who don't already know it that I am a practicing Catholic [albeit a pretty "far left" one] and therefore have no built-in prejudices against the possibility of miracles nor apparitions. As an old scientist, however, I am in line with most Church authorities as being highly skeptical of Marian apparitions, believing most of them to be unsupported claims of people who desperately need their shaky faith-levels bolstered. I believe that the Church sanctions only five Marian apparitions as veridical . This post was inspired by the purchase of the pictured book from our famous/notorious bookseller-to-the-UFO-community, Bob Girard. Bob doesn't believe in any of this "christian" stuff himself, but has curiosity about all things anomalous. He therefore offers, occasionally, unusual and sometimes very rare items on a variety of "Fortean" type topics. I didn't need a history of Mary, but Bob stated that this book had an appendix which was the first report of the witness testimony to the Knock apparition. THAT was interesting, and so I bought the book. This post is my attempt to you to pass on what was in that appendix. The story of divine apparitions appearing in grilled cheese sandwiches has long been a point of humor among those sharing the anecdotes with others. And while the idea of trees bearing the image of Christ and areas of fog on windows may provide some more credibility than the others, there is at least one case from France in 1907 that said the figure of the Virgin Mary appeared in split hailstones which fell by the thousands on a small village. The case remains unexplained to this day. The story, which was run in the Galveston Daily News weeks later, shared the account of several witnesses who confirmed that the event had not only happened, but was even more spectacular than it sounded to distant readers. The amassed witnesses, according to the news outlet, numbered 107 and each were convinced the events were paranormal in nature. Not only that, but the religious population were thoroughly convinced that the event was a direct message to the city council’s decision to cancel a parade that had been scheduled to honor the Virgin. It’s unknown if the divine intervention was enough to move the city council to change their minds, but there is another interesting point to the story - and that’s the reaction of the scientific community. The “official” scientific explanation at the time was that a fungus had entered the clouds somehow either carried by wind or some other force like a small cyclone. As the fungus was airborn, it was held aloft by very strong air currents and spread through the clouds until it fell back to Earth when the droplets fell and hardened from the intense cold. When asked why the images were all in the form of the Virgin Mary, the scientists replied that it was a simple matter of divine intervention. When things like this happen I have always believed a greater power makes one see strange phenomena. And I'm not referring to God.. What is in our minds is shown to us. Who knows our minds. our beliefs.. our terrors our solitudes? People quote you see what you want to see, you see things you believe in. Who has a better way of talking to us? CHAMPION, Wis. (RNS) Philip and Barbara Hesselbein came to the Shrine of Our Lady of Good Help to pray for a grandson who has an inoperable brain tumor. Darlene Searcy prayed for her family and for herself; she has cancer. Mary Spakowicz, who also has cancer, came "because God will hear me here." The afflicted and the faithful have long made pilgrimages to the quiet country site where Belgian immigrant Adele Brise said in 1859 that she saw the Virgin Mary three times. For the past few years, maybe 30 or 50 people had trickled in daily to visit the chapel, Brise's grave and the candlelit crypt that marks the site of the apparition. That changed in December, when Bishop David Ricken of the Roman Catholic Diocese of Green Bay certified after investigations by three theologians that Brise had indeed seen a beautiful lady in white who said she was the "queen of heaven." That made the shrine, which is a mile from the unincorporated town of Champion, the only official site in the United States where Mary is said to have appeared. Now there's a steady flow of traffic into the recently enlarged gravel parking lot. Cars, vans and buses bring 500 people -- and often many more -- here daily. License plates from Ohio, Minnesota, Missouri, Illinois and Indiana were spotted one recent weekday. A new building houses much-needed restrooms. A former boarding school on the site is being refurbished to house two priests recently assigned full time to the shrine. "I knew that there would be some increase in interest" after he certified Brise's vision, Ricken says. "I wasn't sure how wide it would be, how broad it would be." Our Lady of Good Help attracts far fewer visitors than international Marian shrines such as France's Lourdes, which draws 5 million a year, or Mexico's Our Lady of Guadalupe, which has double that. Still, Ricken expects the number of visitors to continue to rise and says the diocese is trying to figure out how to accommodate them without losing "the simplicity of that beautiful shrine and the peace of the place." The farming area around the shrine is changing already. "If the rumors are right, it's going to look like downtown Chicago pretty soon," says Louie Gomand, who owns a farm adjacent to the shrine. A farm stand on his property sells vegetables and water to visitors. A sunflower costs 50 cents and a gourd 35 cents. A handwritten sign reads "bus specials." There's a lot more traffic, he says, but he has no complaints. Neither does Kelli Vissers, 34. She and her husband, David, 38, own two buildings in Champion. "Since the shrine happened" in December, "the traffic has quadrupled through here," she says. They have converted a small trailer into the mobile On the Way Cafe. Kelli Vissers said she hopes to cater meals for tourists and turn one of the buildings into a bed-and-breakfast and the other into a full-scale cafe. Barb Cornette, 58, who grew up in the area and now helps run a dairy farm a couple of miles from the shrine, says some residents have mixed feelings about its growing popularity. "Traffic has increased tremendously," she says. "Some of the area farmers that are retired want to sell their land ... for possibly a hotel, a restaurant. They're looking for the gold mine, unfortunately," she says. We see what we need to see sometimes..or we're led to see what we need to see.. especially when times are rough. This I believe. New Delhi (CBCINews): A statue of Mother Mary with tears of blood is attracting thousands of Christians and people of other Faiths in Ghaziabad, Uttar Pradesh. The event has occurred in the community chapel of the CMI Bhavan of the Carmelites of Mary Immaculate (CMI) in Mariam Nagar, 14 July. The event was first noticed by a maid called Sunita who works in the institution on Saturday around 11. 30 am when she came to clean the chapel. “Today when I was about to wipe and clean the statue of Mother Mary with a cloth I found tears of blood rolling from Mother Mary’s eyes. I cried aloud. I couldn’t believe my eyes so I rubbed the blood from the statue but the flow continued” Sunitha said. The priest in charge of the house, Fr. Joy Kizhakkayil CMI, said, “As I came inside the chapel I could see Sunitha holding the statue and shivering, praying and crying aloud to Mother Mary”. Ms. Mary, a Senior staff nurse at New Delhi’s All India Institute of Medical Sciences (AIIMS)i, who was present in the monastery when the event took place said, she could see the tears of blood of Mary and she touched it with reverence and fear. “The news spread quickly and soon people started rushing to the chapel” said Brother George CMI. Some 65 catholic families living in the surrounding areas also rushed to see the miracle. By evening some three thousand people had visited the statue. “Due to the rush the police had to be called”, he added. He said that they have also took the blood samples and got it tested at the St. Joseph Hospital nearby. “The result has shown that the blood group is B+ve,” he added. Visitors and faithful are bringing and keeping the rosary on the blood clotted statue and praying rosaries continuously in the chapel. The event took place at the personal chapel of CMI Bhavan where at present a new wing for the Christ College, Bangalore is under construction. The statue was bought from St. Paul’s Centre, New Delhi few months ago. A family from Kirkland, Ohio got a supernatural shock over the weekend when they were looking over photos of their young daughter and noticed a familiar figure hovering near her. Jen Potter believes that the ghostly apparition captured in the image is none other than the Virgin Mary, looking over their daughter Erin, who was battling cancer for the third time. "My reaction immediately, it's Mary, they hear us, she's there. I didn't necessarily see it as a sign that Erin is fine and is going to walk out of this, but it's a sign that we're watching over her." Jen told 19 Action News on Friday. Erin was diagnosed with leukemia in February 2007 and since gone through numerous bone marrow transplants. When the miraculous photo was taken, she was about to undergo her second transplant. When asked about the skeptics (whose rather shameful lack of sympathy, compassion, and tact can he seen in these Huffington Post comments) who would cast doubt on the vision that gave the Potter's hope during their emotional medical battle, Erin's father Kevin remained resolute in his belief. "I know she's not alone, I know we are not alone and people who don't want to believe it, that's OK," he said. "Whatever happened, you know something powerful and special was there with us I definitely have my moments when I'm falling apart and I'm terrified and I literally grab my phone and I stare at that picture." Here’s a way to get your shirts to sell better. Say the art is from the hand of God. Man says Virgin Mary appears in tie dye t-shirt – Sarasota News | Mysuncoast.com and ABC 7: Local News. “I have a basic idea of what the shirts going to look like but I tell every one God does he real art work because where the shirt folds and how the dye runs is up to him and it often makes different images,” said Tim Symonds. He says , this time the image created from the unpredictable tie dye process appears to be that of the mother of Jesus. “When I unfolded the shirt I noticed mother Mary was in the center of one the shirts by the heart,” Symonds added. Well of course you can see faces in tie-dye – faces are symmetrical and tie-dye is like a Rorschach test. It’s a bit irritating when these articles focus on it either IS or ISN’T a picture of the thing the person says it is. The third option is the correct one: It’s pareidolia. We see faces and familiar images in lots of things – it’s the way our brain works. And the object? That 'hook' that makes a buck. I apologize for the cynicism in this piece but weeping statues are lame. They have been disproven “miracles” time and time again. But, here we go… and the faithful will believe. Hundreds flock to ‘weeping’ Mary statue in Israel. It’s garnered quite a reputation in the area as people have flocked to see the “miracle”. That was exactly the intent. A display of a miracle of faith is very powerful. But the truth is unpalatable to many Catholics — weeping statues are easily (and often) faked. There is no need to invoke a miracle to account for it. The use of nondrying oils, like olive oil, are commonly applied to the statue to create the appearance of tears. We may have a case here of what is called a “pious fraud“, where people fake the event in order to bring people to the faith (still fraud). The Catholic church is very hesitant on declaring such claims “miracles” because of the past history of fraud. So, I’ll play the odds here and say that this is not a “miracle” either. Mary may weep for humanity; so do I.
Mary is everywhere: Marigolds are named for her. Hail Mary passes save football games. The image in Mexico of Our Lady of Guadalupe is one of the most reproduced female likenesses ever. Mary draws millions each year to shrines such as Fátima, in Portugal, and Knock, in Ireland, sustaining religious tourism estimated to be worth billions of dollars a year and providing thousands of jobs. She inspired the creation of many great works of art and architecture (Michelangelo’s “Pietà,” Notre Dame Cathedral), as well as poetry, liturgy, and music (Monteverdi’s Vespers for the Blessed Virgin). And she is the spiritual confidante of billions of people, no matter how isolated or forgotten. Apparitions of the Virgin Mary have been reported throughout post-New Testament history, but in the last 450 years alone there have been more than 2000 reported sightings (see the map below for a graphic representation - the National Geographic story has a larger version for ease of viewing). The Catholic Church however is very careful in officially recognising such events, with only sixteen of those being sanctioned as true miracles. Their pain-staking process of investigation covers many aspects of each sighting, though "the 'authenticity' and mental stability of the seer are prime, and anyone suspected of trying to gain fame or riches from contact with the Virgin Mary is ignored or condemned". Furthermore, "the Vatican would never approve an alleged apparition whose message contradicted church teachings, and the faithful aren’t required to believe in apparitions." The locations of apparitions and healings, such as Lourdes and Medjugorje, have become famous the world over. Mary barely speaks in the New Testament, but her image and legacy are found and celebrated around the world. As the sun sets in Medjugorje, Bosnia and Herzegovina—a hot spot for Virgin Mary sightings—devotees of diverse faiths and nationalities gather to pray. It’s apparition time: 5:40 p.m. In a small Roman Catholic chapel in Bosnia and Herzegovina, in the village of Medjugorje, Ivan Dragicevic walks down the aisle, kneels in front of the altar, bows his head for a moment, and then, smiling, lifts his gaze heavenward. He begins to whisper, listens intently, whispers again, and doesn’t blink for ten minutes. His daily conversation with the Virgin Mary has begun. Dragicevic was one of six poor shepherd children who first reported visions of the Virgin Mary in 1981. 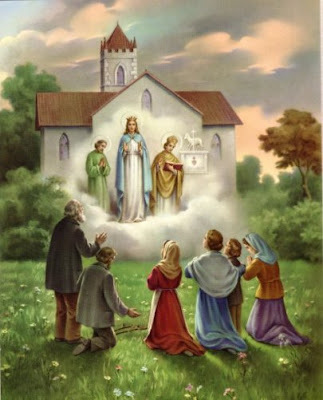 She identified herself to the four girls and two boys as the “Queen of Peace” and handed down the first of thousands of messages admonishing the faithful to pray more often and asking sinners to repent. Dragicevic was 16 years old, and Medjugorje, then in communist-controlled Yugoslavia, had yet to emerge as a hub of miracle cures and spiritual conversions, attracting 30 million pilgrims during the past three decades. 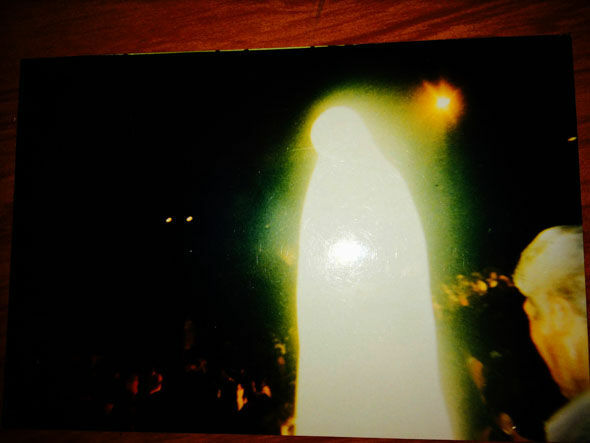 PARANORMAL researchers are investigating a mystery photo which has been said to show the Virgin Mary appearing before an amphitheatre full of worshippers. 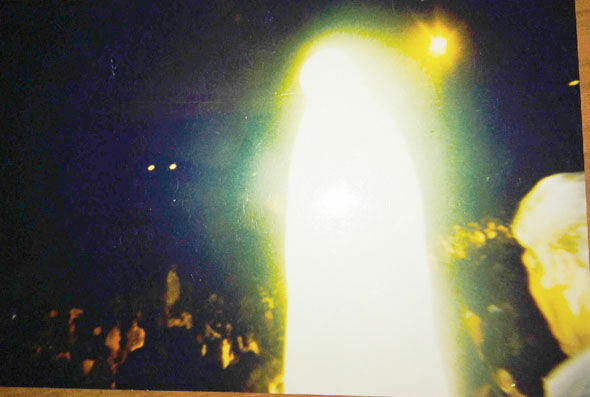 The remarkable image appears to show the shape of the Virgin Mary appearing towards the front of a packed crowd, as if being beamed in from a source up above. It was taken at a mass held by a high-ranking Catholic priest who claimed to receive messages from the Madonna herself. Yet the shape of Mary is a striking white in contrast to the yellowish light behind her. The person who handed the image to an organisation that investigates UFOs and the paranormal has not been named, however they sent in what appears to be a photograph of the original printed picture. The source claims the original snap was taken in 1994 during a huge Catholic mass called a cenacle given by Italian priest Father Stefano Gobbi at the Paolo Soleri Amphitheater, in Santa Fe, New Mexico, USA. Father Gobbi, who has toured the world, was encouraged by the then Pope and was scrutinised by the church over claims of having mystical dealings with the Virgin Mary. The source of the image gave no other information than to mysteriously say it had been given to them by a stranger - who also went unnamed unnamed. They wrote to the investigators: "A stranger gave me this photo. My first thought was the Virgin." The image was bizarrely sent to a team of UFO researchers, but has been logged for investigation due to the extraordinary nature of the photograph. Express.co.uk enquires have established that Father Gobbi died aged 80 on June 29 2011, but spent more than three decades holding special mass gatherings centring around the Virgin Mary. In his liftime he "traveled the world holding Cenacles of Prayer on every continent", according to an article on Father Gobbi by Colin Donovan, vice president for Theology, at the Global Catholic Network, on the organisations's website. The gatherings began in 1972 after Father Gobbi set up the Marian Movement of Priests in 1972 while visiting the Shrine of Our Lady of Fatima in Portugal. The movement was formed to encourage Consecration, especially of priests, Immaculate Heart of Mary and whole-hearted fidelity to the Pope. But it also sparked some controversy by Father Gobbi's claims "to receive interior locutions from the Blessed Virgin", according to Mr Donovan. These "messages" said to be received by him in prayer were published in his spiritual diary To the Priests, Our Lady's Beloved Sons. According to Mr Donovan there had been some scrutiny of Father Gobbi's "claims of mysticism" high up in the Catholic Church. He added: "In the case of alleged mysticism there is always the possibility of mental illness, fraud, vivid imagination, or even the demonic. "It is the task of a qualified spiritual director to discern, in the first instance, the authenticity of mysticism, basing himself on his knowledge of Catholic teaching, the personality, character and prayer life of the alleged mystic and his own experience in directing others. “My reaction immediately, it’s Mary, they hear us, she’s there. I didn’t necessarily see it as a sign that Erin is fine and is going to walk out of this, but it’s a sign that we’re watching over her.” Jen told 19 Action News on Friday. When asked about the skeptics (whose rather shameful lack of sympathy, compassion, and tact can he seen in these Huffington Post comments) who would cast doubt on the vision that gave the Potter’s hope during their emotional medical battle, Erin’s father Kevin remained resolute in his belief. As for Erin? Well, she’s now cancer free. Would that hope change if I told them that the "figure" behind their daughter was actually the future? An image of their daughter all grown up? That's how I see it. So what? 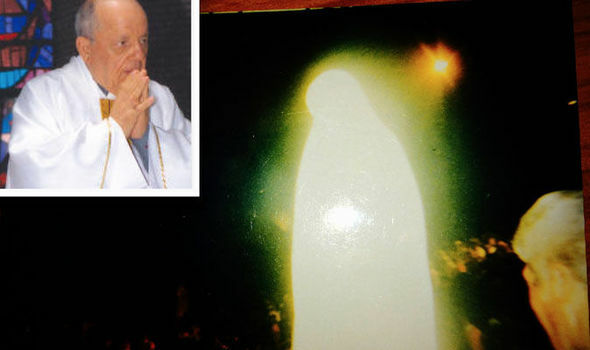 Claims of religious apparitions are nothing new, but a recent “miracle” sighting of the Virgin Mary above County Mayo, Ireland stands out due to the sheer size of the crowd claiming to see it. On Saturday June 10, a few thousand believers gathered at the Knock Shrine in northwestern Ireland, the site of an alleged group apparition in 1879 in which over a dozen people claimed to see the Blessed Virgin Mary, Saint Joseph, Saint John the Evangelist, angels, and Jesus Christ appear all at the same time. Nearly a hundred and forty years later, a crowd reportedly numbering close to two thousand showed up at the shrine hoping to catch a sighting of the Virgin Mary, and they weren’t disappointed. As it turns out, a young Irish traveller boy foretold this sighting over a month ago after having an unrelated sighting thousands of miles away. Strange enough yet? 14 year old Irish boy who was in Fatima may 2017 had visitations from our blessed virgin mother Mary and who also told him that she would give a sign to the people on the 10th of June 2017 in knock shrine co mayo in Ireland,, please like and share as much as possible thank you. Some sort of optical illusion? Definitely see something in the infrared. I just don't understand why it is so important to see the mother of Jesus, instead of Jesus Himself? All I can personally fathom is "seeing" Mary brings comfort to people. Whereas seeing Jesus in the sky would make people think it was His second coming? IDK. Its hard to keep track of what everyone "believes"..... about anything. Workers at a hospital in Argentina were amazed when a discoloration that bears an uncanny resemblance to the Virgin Mary appeared on a wall. The director of the Military Hospital of Cordoba dubbed the anomaly "a manifestation of the Mother of God" and mused that the facility is a particularly appropriate place for such an "unexpected miracle" to occur. With that in mind, he explained that they have set aside a window of time during the day for patients' relatives to have access to the spiritual-looking stain for prayer. As to where the discoloration may have come from, it seems that there may be a less-than-divine origin for the oddity. Directly beneath the 'Virgin Mary' is a heater that likely provided the perfect combination of warm air and dust that eventually settled on the cold wall above it in the pattern that has mystified hospital staff. What's your take on the strange stain? A sign from 'above' or simply an indication that someone at the hospital should probably clean their heaters? Let us know at the Coast to Coast AM Facebook page. HOBBS, N.M., (KRQE) - Some are calling it a miracle. People are coming from all over to visit a Hobbs church after hearing its Our Lady of Guadalupe statue started to cry during mass Sunday. "It is a miracle, nothing short of a miracle,” said Paul Campos, who attends Lady of Guadalupe Catholic Church. Worshippers from across New Mexico and Texas are driving to see what many believe to be an act of God. "We immediately came, we had to see this for ourselves,” said Alice Rivas, from Denver City, Texas. Rivas heard about it on social media. She drove 40 minutes for the opportunity to just to touch the statue and pray before it. “You just get all jittery. I mean, you – you could just cry. I couldn't help but just tears,” said Rivas. “You're never too prepared for something like this,” said Rev. Jose Segura with the help of a translator. “He wanted to call the bishop from Las Cruces right away to see what he needs to do because he's never encountered anything like this." Father Jose Segura says parishioners noticed them after Sunday's noon mass. “He noticed that a lot of people were coming up to Our Lady and started touching her. That's when everybody started noticing she was weeping." Father Segura believes she's crying because of all of the recent violence in the United States and around the world. "You can even get a sense of her presence. You can smell roses in her tears. I've got a tissue that I've taken, wiped from her mantle,” said Campos. The faithful who witnessed it say it's nothing short of a miracle. "I actually saw how she was dripping, and that's when I took the video and it's just incredible,” said Marcelo Servin, who’s attended the church for about 10 years. Servin, who has cancer and lupus, also believes the virgin has healing powers. "Ever since I got here, for some reason, I've been feeling good. I've been out of bed doing stuff around the house,” said Servin. The father says the statue was built in Mexico and was on loan to this church. They will now try to keep it permanently. The Archdiocese of Las Cruces has been called in to investigate. He says the church treats their investigation in a very scientific way. Those at the church say at one point, the "supposed" tears were soaked up with cotton balls and preserved as part of that investigation. There has been a significant cluster of reports of Marian phenomena across the Americas during the first half of 2018. This post will attempt to summarise the key cases covered in the media, starting with the most recent. July 2018. El Paraiso, Honduras. An image of the Virgin at the Shrine of St. James Campus of the Catholic University of Danli, El Paraiso began to weep in mid-July according to priest Juan Angel Lopez. Latribuna had the report. 19 May 2018. San Pedro, Soledad, Mexico. A small image of the Virgin in the home of Maria Guadalupe began to cry a liquid similar to tears commencing on Sunday 9 May, according to Pulso. 15 & 17 May 2018. Jinotega, Nicaragua. Lajornadet reports the Diocese of Jinotega claiming that an image of the Virgin Mary located in the Vicariate of St. Maximilian Kolbe had wept on Tuesday 15 May and Thursday 17 May. The events were supported with photographs and the testimony of local priest Rafael Rios Gadea. Mid May 2018. Toabre, Panama. 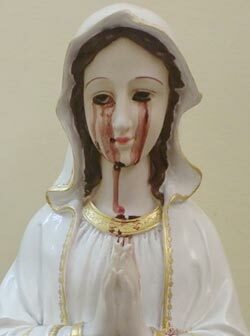 Critica.com states that an image of the Virgin of fatima has begun to bleed from the forehead, nose and lips. The Catholic Church is investigating. 6 May 2018. Chonatales, Nicaragua. Some devotees assured a Qhubo reporter that they had seen a tear fall from the right eye of an image of the Virgin of Cuapa. Aurora Ubau José Duarte said at about 8:30 pm on the 6th of May he had seen the tear fall. He also said he prays the rosary daily and asks the Virgin to intercede with God to bring peace in the country. May 2018. Hobbs, New Mexico, USA. A Bronze statue of the Virgin at the Our Lady of Guadalupe Catholic Church in Hobbs appears to be weeping an oily substance that smells of flowers. The phenomena appears to have commenced in mid-May. The phenomena appears to have commenced in mid-May. 25 April 2018. Guatemala City, Guatemala. According to Gaudium Press, ‘abundant’ tears were observed on a statue of the Virgin in the House of Formation of the Heralds of the Gospel, in San José Pinula, near Guatemala City. April 2018. San Jose, Costa Rica. The same article in Gaudium Press states that a similar event took place at at the home of the Heralds of the Gospel in San Jose. Early April 2018. Morroa, Sucre Department, Colombia. Noticias Caracol reports that a figure of the Virgin Mary held in a private house had begun to weep oil. March 2018. San José de Metán, Argentina. Eltribuno describes how a small image of the Virgin owned by the Cold-Mendoza family of Granadero Diaz has shed tears of what appears to be blood 26 times in the past year. February 2018. Ciudad, Jaurez. Mexico. A plaster image of the Virgin in the Ramirez home has shed tears since early January reports Milenio. A Virgin Mary statue has been ‘weeping’ olive oil. Church leaders can’t explain it. Unlike tortillas or toast imprinted with an image of the face of Jesus, it’s not often that a church or holy place has a statue that appears to be weeping. It’s even less often that people less faithful than the true believers are unable to disprove the apparition and have no logical explanation for the occurrence. Yet that’s the situation at Our Lady of Guadalupe Catholic Church in Hobbs, New Mexico, where a bronze statue of Our Lady of Guadalupe has appeared to be weeping since May 20th and both non-partisan and Catholic experts are at a loss to explain it. This isn’t just a few drops of teary liquid either – multiple gushes over the course of two months has resulted in 500 milliliters or two cups of it being collected (photos here). The Las Cruces Sun News reports that a teaspoon (5 ml) of the liquid was taken by an investigative team working for the local bishop, Bishop Oscar Cantú, and sent out for analysis. The result was not tears, says the bishop. The anointing oil used for church ceremonies is referred to as “chrism” or myrrh and it has been in the news a lot lately. A researcher in England claims that the formula given in the biblical story of Moses receiving the first anointing oil from God may indicate that it contained cannabis oil, which could explain some miracles like the curing of people with symptoms of epilepsy. Deacon Jim Winder, one of the diocesan investigators, says no chrism oil was missing from the church. Since its first appearance on the statue, cameras have been set up to monitor it, the ceiling has been investigated for leaks (none found) and nothing appears to be unusual or suspicious in the general surrounding area. The hollow statue has reportedly been inspected inside and out and nothing strange was found … other than cobwebs. What’s next for the weeping statue at Our Lady of Guadalupe Catholic Church in Hobbs, New Mexico? Father Jose “Pepe” Segura, the church’s pastor, is trying to deal with the crowds it is attracting from around the country. Not surprisingly, Bishop Cantú wants to wrap up the investigation by September when he is scheduled to be transferred to the diocese of San Jose, California. Would proof of a miracle get him a better gig? He especially wants to find sufficient evidence to determine if the tears are from “Satan or God.” Who is the ultimate decision-maker? Meanwhile, the scientists are baffled, the believers pray for answers and the statue is working on its third cup of olive oily tears. Does anyone have the pope’s number?